A healthy business trip starts with choosing the right hotel for me. Whether it's a short two-day trip or a week-long stay, being in a comfortable hotel AND at a convenient location is crucial to me. My recent business trip to New York City is a good example. A little homework goes a long way... researching for an ideal hotel, mapping out all my must-see spots and museum exhibitions, or downloading useful apps for the phone while traveling (the NYC subway app is an essential one in this case). 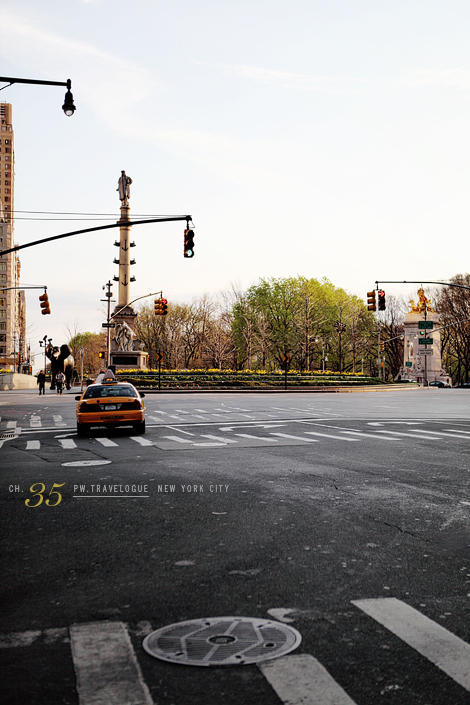 I knew I wanted to be near Central Park, so I chose Six Columbus, a Thompson Hotel at Columbus Circle. I also like to have at least a day to myself before the hectic schedule begins, so planning my agenda ahead of time really pays off. Watching the city wake up is one of my favorite things to do, even when I lived in New York years ago. Finding time for myself has become a routine for me these days. The top photo was the first image I took of this trip — the morning of my arriving at the hotel in Columbus Circle. It was that one perfect moment with a cab on an empty street, the sun casting a warm glow across Central Park... The blossoms were in full bloom all around the Park and it made me happy just being there. Also stopped at the Metropolitan Museum of Art for The Steins Collect exhibition. If you haven't seen it, please do. You will not be disappointed. Rooms after rooms of paintings by Matisse, Picasso, Cézanne, Degas, Gauguin... the list just goes on and on. Dining for one has also become somewhat of a ritual for me at museums these days, and I have to admit, I quite enjoy it. While I was at the Met, I was seated at a table with a view at The Petrie Court Café and Wine Bar — looking out to Central Park while enjoying a late afternoon lunch was absolute perfection. How many times have you heard someone say that? And yet, it rings true every time. I came upon an alto saxophonist (pictured above) at Central Park earlier on the day. I watched him play for a good ten minutes before he took a break. I struck up a conversation with him and found out he has been playing under the same arch for over a decade, everyday. Listening to him play was a gentle reminder that you HAVE to love what you do. Find that balance between work and pleasure — allow yourself the time to decompress, walk the city, listen to the sounds, immerse yourself into nature, and if you are lucky enough to spend a few hours at a museum, be inspired by works of art. You will leave your destination with a new-found joy in business trips, and hopefully, get to know yourself a little better as well. It is a wonderfull exhibition ;"The Steins Collect" ,do not miss it . I visit New York along time ago...alone! traveling from my country the Netherlands, and yes, at first i was a bit nervous about it..but after a while..i just embrace the "loneliness" and it felt good. People approach me and talking to me, sharing stories, stories which i would even consider to tell friends/colleagues ..and now i missed this so much while reading your post..reminds me of a lovely time..just by myself! After this trip i think i found a new me!! Would love to go back...btw i've visit the Metropolitan a whole day. I love the photos and the advice given on what to visit. Thanks for posting, I've been looking for such advice and information. Thank you for this beautifu NY story. It makes me think that in New York it's almost summer and where I am, in France, it's almost... december ! Rain, rain, rain and cold. Merci from a Chilean travel writer freezing in Paris !